The Beloved Bracelet is our best selling bracelet. This set of three bracelets for a mother of three is so simple yet meaningful. Mix the metals and stack them together! 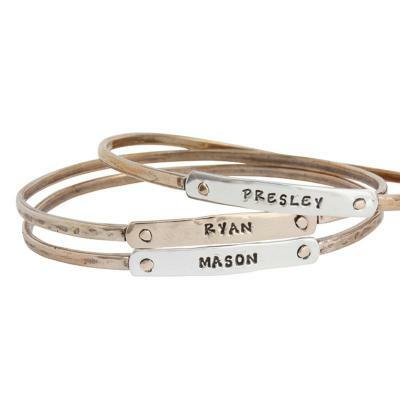 This set of three personalized mother's Beloved Bangles is a simple way to show your love. We love the versatility of the metals ~ you can mix and match to create the perfect stack of bracelets. We offer three different metal combinations so you decide if you want to mix it up or match them all. Anything you decide will look great, and be meaningful to you! Personalized Stamps: children's names, birth dates, nick names, an anniversary date or an inspirational word. The price listed is for three bronze/bronze bracelets. If you choose different metal combinations the price will change. The bracelets can be ordered in four different metal combinations. Please note, the letters on the bronze nameplates do not darken as much as on the silver nameplates. We gave these to my 70 year old mother-in-law for Christmas. The names of her 3 grandchildren. She was delighted and a little emotional. She loves the style and said she will never take them off!